AMES, Iowa (AP) — No. 6 West Virginia will head into the second Saturday in October as the Big 12’s last undefeated team. Throw in a chilly forecast, a nighttime finish and a stingy Iowa State defense, and West Virginia — fresh off a turnover-riddled win over Kansas — could be on an upset alert from the opening kick. Still, West Virginia has beaten all comers behind an attack led by quarterback Will Grier and an underrated defense that’s among the best in the Big 12. West Virginia (18.6 points per game) is the only team in the conference giving up less than 20 an outing, and it ranks behind only TCU with just 332 yards allowed per contest. Despite throwing three picks last weekend, Grier is having a fantastic senior season. Grier has thrown for 21 touchdowns to 10 different receivers, and he is completing 71.2 percent of his passes while averaging 10.28 yards per attempt. “All of these guys can make plays, and it’s my job to make the right reads and get us in good plays and get the ball in their hands,” Grier said. Pressed into duty last week in hopes of reviving the offense, Purdy responded with 318 yards passing and four TDs and 84 yards rushing and another score. But it is unclear if Purdy will have star running back David Montgomery to hand the ball off to. Montgomery hurt his upper arm late in a 17-14 loss to TCU on Sept. 29 and didn’t play last week. Iowa State has won four of its last six games against ranked opponents — including a 14-7 home win over then-unbeaten TCU last season — after dropping 20 straight to Top 25 teams. 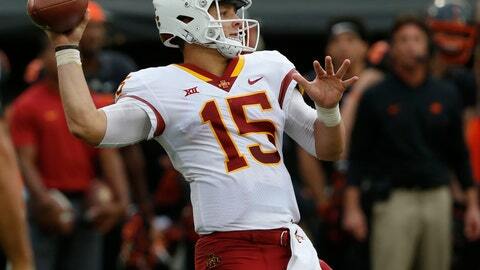 The Cyclones are 1-1 against ranked teams in 2018, falling to Oklahoma by 10 before knocking Oklahoma State out of the poll with a win. The only team to get within 10 points of West Virginia is Texas Tech. The Red Raiders fell 42-34 in Lubbock two weeks ago. … Iowa State broke its school record with 16 tackles for loss against Oklahoma State and tied the team record with seven sacks — recorded by seven different players. … West Virginia has 27 touchdowns in 56 drives this season. …The forecast calls for partly cloudy skies and a wind chill in the 40s for kickoff. And though Iowa State typically does a great job maintaining its grass field, central Iowa has been inundated with rain for weeks. “We’re going to put (Josh) Norwood on Keith (Washington Jr.) shoulders and let them cover them that way.” — West Virginia defensive coordinator Tony Gibson on Iowa State’s receivers, one of the tallest groups in the country led by 6-foot-6 Hakeem Butler.